Car Rental Dubai Blog > Car Rental Guide > Is my country driving license valid in the UAE? More than 22 million tourists visited the UAE in 2017, while Dubai alone was graced by 15.8 million tourists during the same period as per the UAE Government’s official portal. We reckon the figures will be even more staggering for the year of 2018. While half the visitors come here for business purposes or job opportunities, a huge number travel the UAE for a luxury holiday like none other. It’s important to check if your home country’s driving license is eligible or if you need an international driving permit beforehand if you’re planning to rent a car and drive in Dubai. If you’re one among the many visiting Dubai, Abu Dhabi or any of the emirates, did you know that you can legally rent a car on your country’s driving license? Yes, say good bye to your travel woes, inconvenient metro rides and expensive taxi fares. Rent any type of car in the UAE through yours truly and drive at your pace! 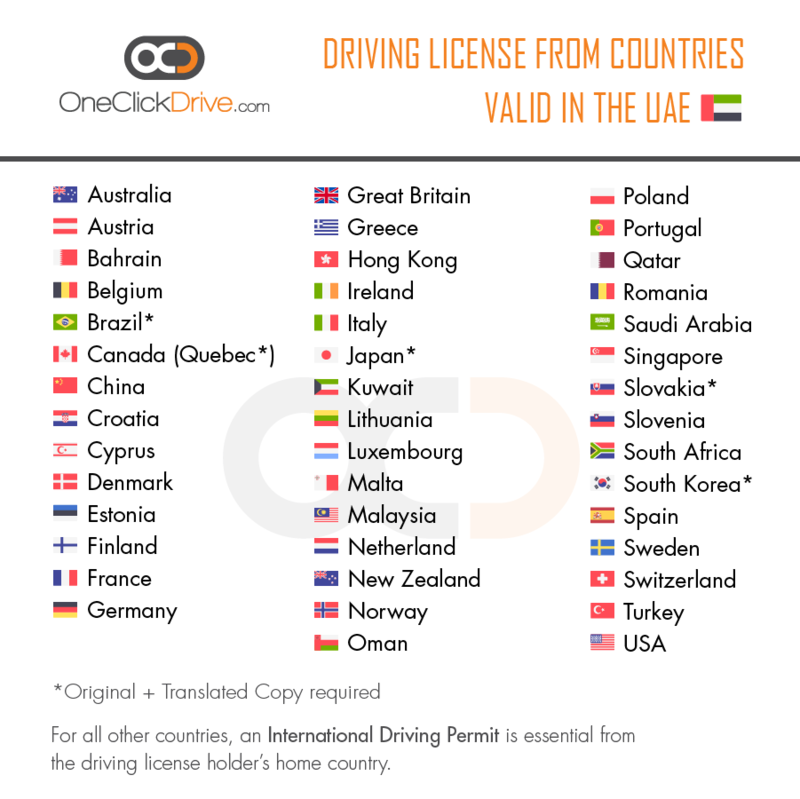 Driving license from all the above mentioned countries are valid in the UAE. Note you must be visiting the UAE on a visit/tourist visa. Residents need to convert their home country driving license to UAE driving license. Those countries (states) marked with a * require to carry their Original Driving License + Translated Copy. Want to update this post? Let us know in the comments below. You can drive on their home country’s driving license (if applicable, see list here) or they’ll require an international driving license together with their home country driving license.